1893. The Life of Sir Richard F. Burton. 2 vols. London, Chapman and Hall. A primary source for many of the Burton 'facts'. 1887. Richard F. Burton 2 vols. London. The first life, written partly with Burton's own cooperation, which was withdrawn after he became dissatisfied with the results. Much of volume 1 was simply reused by Isabel in her Life, e.g. the description of Burton's Crimean campaign. 1906. The Life of Richard Burton. 2 vols. London, Everett. Notorious for accusing Burton of plagiarizing Payne's edition of the Arabian Nights. Has many anecdotes collected from Burton's contemporaries not available elsewhere. Many thanks to Mick Walton for this superb Punch caricature. 'A bit ahead of us my boy' say Baedeker and Murray's Guide. "Our moonshee", from "Curry and Rice on Forty Plates" by George Atkinson, 1859. An accidental resemblance to Burton? 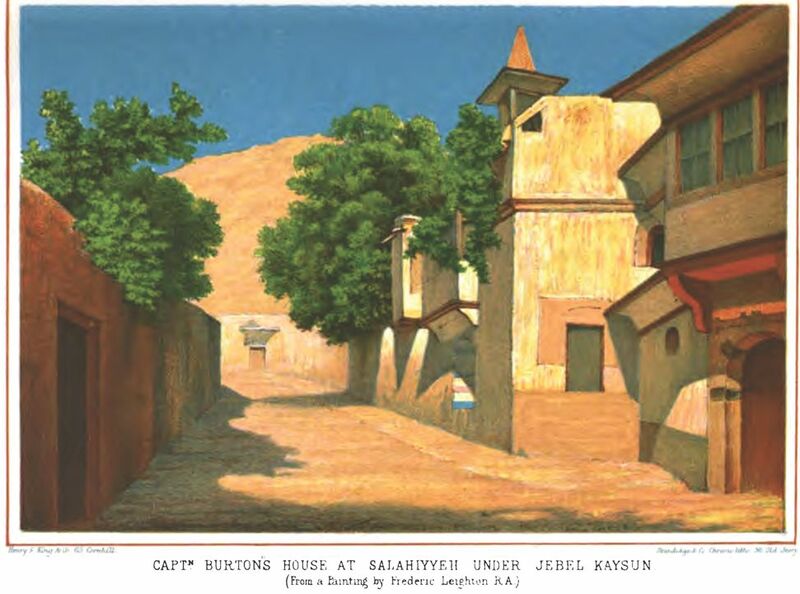 Leighton's portrait of the Burton summer residence at Salahiyyeh outside Damascus. 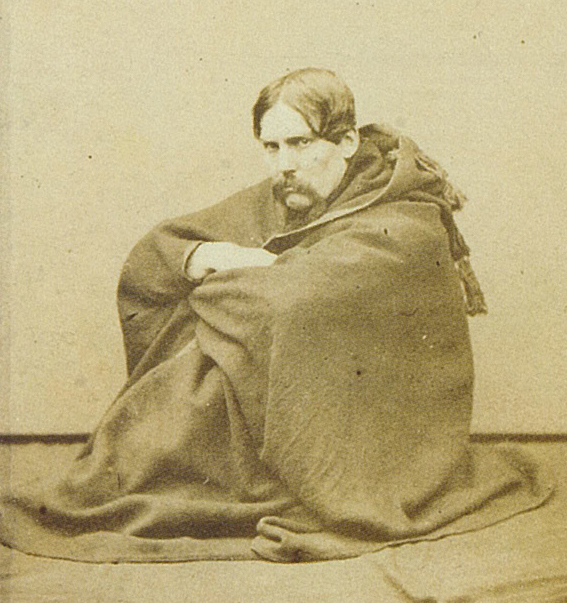 The Highly Civilized Man, taken by Claudet in London in 1861. In the garden at Trieste, 1890. By Dr. F. Grenfell Baker. Soldier, explorer, linguist, ethnologist, and controversialist. 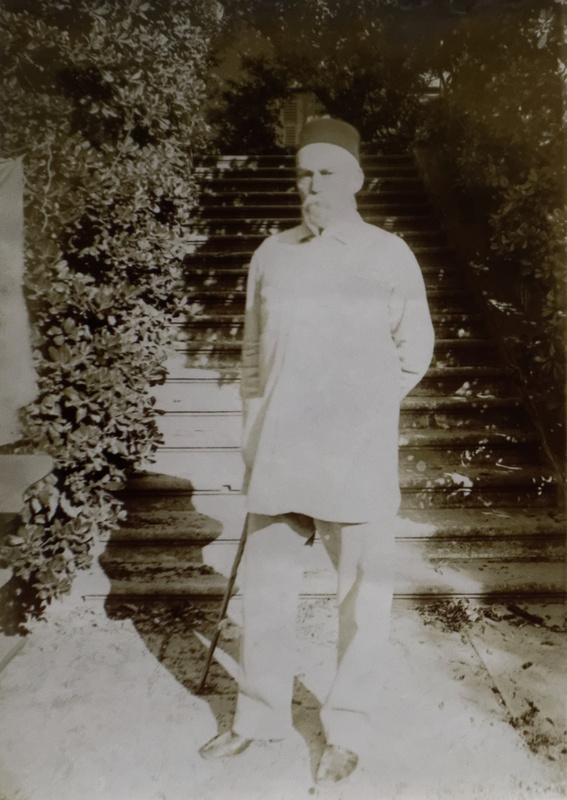 Mostly self-educated, he mastered half a dozen Eastern languages after joining the Army of the East India Company in 1842, and produced ground-breaking ethnological studies of Sindh in the early 1850s. He then completed a famous pilgrimage to Mecca, in 1853, disguised as a Pathan; became the first European to visit the forbidden city of Harrar in 1855; served with Beatson's Horse in the Crimea in 1855; led the expedition to East Africa that in 1858 discovered Lake Tanganyika and, through his deputy John Hanning Speke, the headwaters of the Nile, Lake Victoria Nyanza. After ascending the Cameroons Mountains in 1862, he led a notable mission to the King of Dahomey in 1863; rafted down the Rio São Francisco in Brazil in 1867; collaborated in the publication of the Kama Sutra and Ananga Ranga; and in the 1880s translated the poetry of Camoens from Portuguese, and the first unexpurgated 1000 Nights and a Night from Arabic. He wrote over 80 books, from travel and exploration to anthropology, archaeology, ethnology, poetry and Eastern Literature. 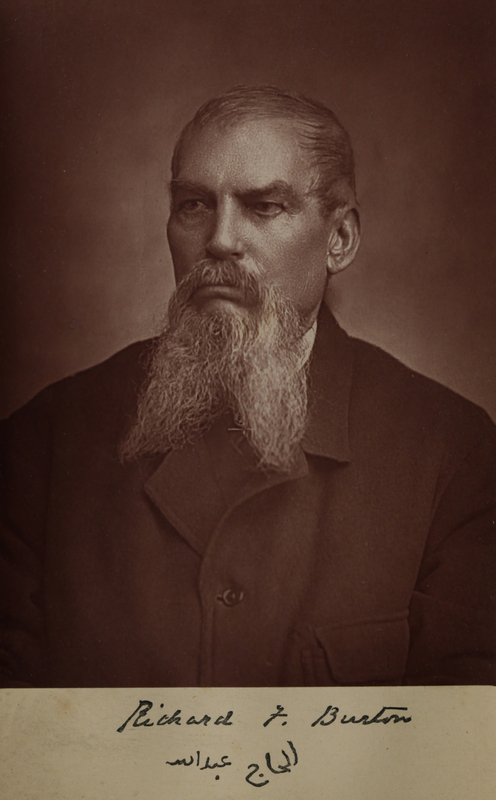 The most recent study by James Newman Paths Without Glory: Richard Francis Burton in Africa, was published in 2011 . Useful summaries of Burton's overall career are provided by his Dictionary of National Biography entry, and his entry in the famous 1911 edition of the Encyclopedia Britannica. 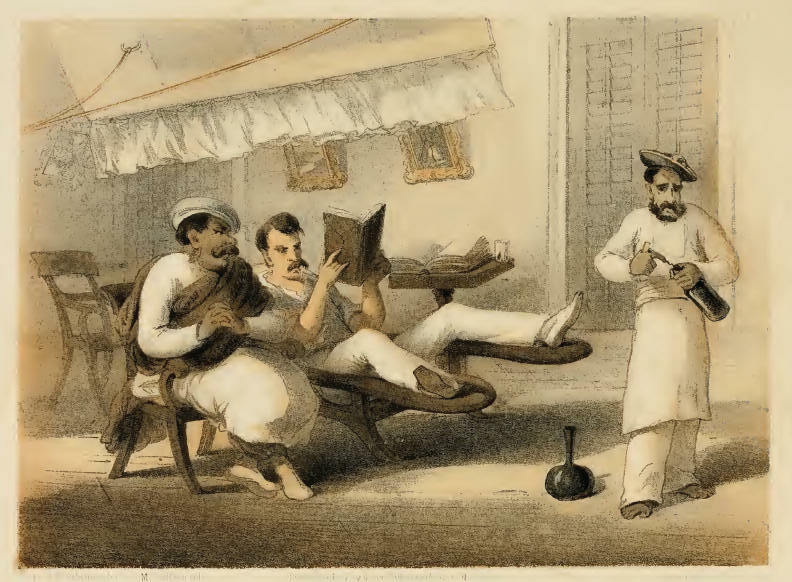 The primary source of information about Burton's early career is is his autobiographical fragment, first published as a postscript to Falconry in the Valley of the Indus (1852). This provides much of the mysterious air which surrounds his early career in the Army of the East India Company, since he intimates that he operated undercover, perhaps as a spy. No independent corroboration of these claims has ever surfaced, but they feature in most mentions of Burton. Also useful are first-hand reminiscences, many of which are listed below. See for example the first reminiscences by his niece Georgiana Stisted from Temple Bar July 1891. Burton has been the subject of a dozen or more biographies, several of which are available here in full. Despite its many flaws, the foundation of these is his wife Isabel Burton's worshipful two volume Life, which contains one long and one short autobiographical fragment by Burton (repeating the Falconry fragment noted above), and is again the only source for many of the stories which surround Burton. The most important archival biography is Mary Lovell's A Rage to Live (1996). Jon Godsall's important biography of Burton, The Tangled Web (2008). is a useful dose of skepticism. Byron Farwell's crisp Burton (1963) is the most balanced and critically detached. Fawn Brodie's The Devil Drives (1967) is still very readable. All biographies of Burton should be read skeptically as many of his biographers tend to accept the stories that surround his life uncritically. 186xx. Anonymous, Biography of Captain Burton Taken from 'Photographic Portraits of Men of Eminence in Literature, Science and Art, with Biographical Memoires by Ernest Edwards, B.A. 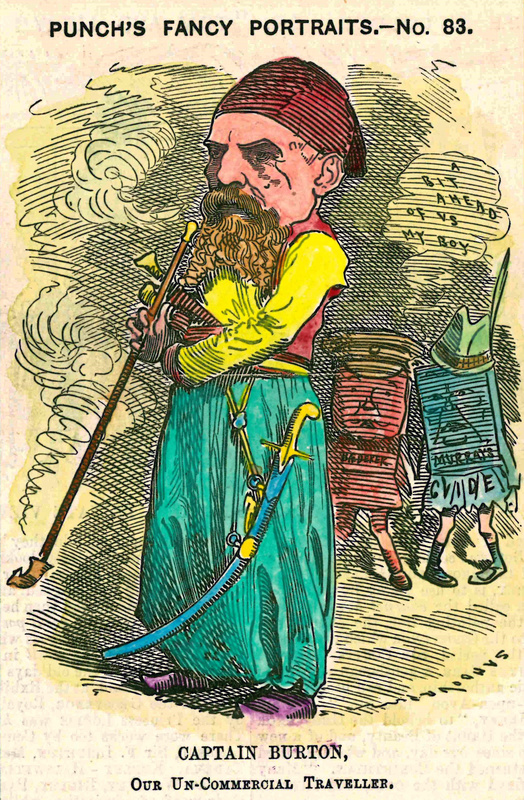 ; from 'Extracts from the Press'; and 'The Anglo-Brazilian Times' of October 1865. Privately printed (no place or date). pp.8. 1880. A Sketch of the Career of Richard F. Burton. 1886. A Sketch of the Career of Richard F. Burton (2nd edition). London, Waterlow and sons. The Bate Richards material is unchanged from the first edition of 1880. Richards knew Burton at Oxford. 1896. The True Life of Capt. Sir Richard F. Burton. London, H.S. Nichols. By Burton's niece, a rejoinder to Isabel Burton's Life. (The Stisteds were convinced Protestants). Some original anecdotes not anywhere else but otherwise deriviative. 1907. The Real Sir Richard Burton. London, T. Fisher Unwin,. Written as a defense of Burton, but introduces nothing new and makes several minor errors of fact. 1931. Burton, Arabian Nights Adventurer. New York, Scribner. 1936. Richard Burton, Explorer. London, Herbert Joseph. 1937. Burton of Arabia. New York, Robert M. McBride Co.
1962. That Blackguard Burton! New York, Bobbs Merrill. Written in historical novel form. Forgettable. 1963. Burton: A Biography of Sir Richard Francis Burton . London, Longmans. (Second edition, 1988 with a new preface). Very balanced, based mostly on the printed sources. 1963. Death Rides a Camel. New York. 1967. The Devil Drives. New York, Norton. Psychobiography, based on extensive research combined with speculation. Very well written. See important corrections in Lovell, 1998. 1978. Sir Richard Burton: a Biography. London, Hodder & Stoughton. Emulates Farwell in its critical distance from its subject. Has the least tendentious treatment of the Nile controversy. 1990. Captain Sir Richard Francis Burton: A Biography. New York, Scribner. Highly imaginative but dubious. Sold well, but seems to have used an interpolation technique to deduce 'facts'. See the profile of Edward Rice at Columbia College Today (or PDF). Rice died in 2001, at age 82, from Parkinson's disease (obit). 1990. Burton: Snow upon the Desert. London, John Murray. 1992. From the Sierras to the Pampas: Richard Burton's Travels in the America, 1860-69. London, Trafalgar Square. 1998. A Rage to Live. a Biography of Richard and Isabel Burton New York, Norton. The best archival biography. Considerable fresh material. An attempt to rehabilitate Isabel (this part fails to convince). 2001. Richard Burton, a traveller in Brazil: 1865-1868. Edwin Mellen. Universidade Federal de Pernambuco. Brazil. 2005. The Highly Civilized Man: Richard Burton and the Victorian World. Cambridge MA, Harvard University Press. 1897. The Romance of Isabel Lady Burton, 2 vols. New York, Dodd Mead. 1941. Sir Richard Burton's Wife. New York, Alfred A. Knopf. 1890. "Burton As I Knew Him"
Fortnightly Review LIV, 878-84, December, 1890. 1891. "Reminiscences of Sir Richard Burton". 1892. "The Partisans of Wild Women". Fortnightly Review Vol. 58, 1-5, July 1, 1892. 1898. James Hain Friswell: a Memoir. London, G. Redway. 1899. Reminiscences. London, Harper & Bros.
1903. Portraits of the Sixties. London, Harper & Bros.
Fortnightly Review Vol. 85, 1039-45, June 1906. 1906. In the Sixties and Seventies. Boston, H. B. Turner & Co.
1906. Personal Reminiscences of Henry Irving, 2 vols. London, Heinemann. 1908. Memories of My Life. London, Methuen. 1909. Autobiography. Boston, Houghton Mifflin. 1912. My Life in Four Continents. London: Hutchinson & co. Contains letters from Burton re gold prospecting in the Juba (ii: 414ff). 1920. Contemporary Portraits. New York, Brentano's. 1922. My Life and Loves. Paris, Privately Published. 1921. My Diaries Part Two [1900-1914]. New York, Alfred A. Knopf. 1921. "Sir Richard Burton as I Knew Him". Cornhill Magazine, No. 304, October 1921, 411-23. 1922. Past Times and Pastimes 2 vols. London, Hodder and Stoughton. 1924. "Memories of Richard Burton". 1930. Portrait of a Diplomatist. Boston, Houghton Mifflin. 1930. Sir Richard Burton, a footnote in history. Boston, A. C. Getchell. Reminiscences from the Dana family, with whom Burton shared a coach on the route to Salt Lake City. 1935. General Rigby, Zanzibar and the Slave Trade. London, George Allen & Unwin. Written by Rigby's daughter this has many Speke/Rigby letters not published anywhere else. 1937. Amberley Papers 2 vols. New York, Norton. 1959. The Swinburne Letters. ed. Cecil Lang, 6 vols. New Haven, Yale University Press. 1956. Journal: Mémoires de la vie littéraire Vol 5., 1861-3. Paris, Fasquelle. 1985. Sojourn with the Grand Sharif of Makkah . Cambridge, Oleander Press. Contains description of journey with Burton in 1854. pp. ix and 6ff.